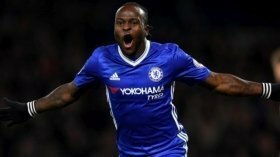 Victor Moses heading for Chelsea exit? Victor Moses could reportedly be heading through the Chelsea exit door this month with Fenerbahce among the contenders to secure his signature. The 28-year-old has struggled for gametime under Maurizio Sarri this term and he has managed just five appearances through the first half of the season. As such, he has already been linked with a number of top European clubs and according to TRT Spor, Fener have already made an approach for the Nigeria international. Still, the Istanbul giants are only eyeing a loan deal for the former Wigan Athletic man and this could put them at a disadvantage with Cardiff City and Crystal Palace willing to discuss straight-cash moves. Moses had been a regular feature for the Blues in the right wing-back position over the past two seasons under Antonio Conte. However, the change of management has resulted in a change in formation and this has hampered his playing time with Sarri viewing him as more of a winger.